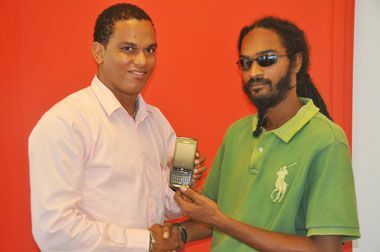 Robinson collected his new handset last Wednesday at Digicelâs Corporate Offices located in the Lewis Building on James Street. On receiving the phone from Marketing Executive Justin John, Robinson said that he was overwhelmed and shocked when he learnt that he had won the handset. Robinson, who is a Graphic Designer at Karib Cable, commented: âI would like to thank Digicel for a promotion like this as it afforded me the opportunity to win this phoneâ. He revealed that he will be giving his other handset (a Blackberry Curve) to a family member. Marketing Executive John said the promotion offered Digicel customers the opportunity to upgrade their handset. Persons were entered in the draw to win the Torch when they added Digicelâs Blackberry pin number (2222245B) to their Blackberry Messenger or scanned Digicelâs Bar Code on the companyâs Facebook page. John stressed that this was just another way of rewarding their customers.